Fired “Today” show host Matt Lauer and wife Annette Roque are taking it “day by day,” an inside source tells People after Lauer was dismissed over allegations of sexual harassment and assault. Both are thinking of their children: Jack, 16; Thijs, 11; and daughter Romy, 14, the source told People. Lauer is fighting to keep their marriage of 19 years together, despite both of them having taken off their rings, the source said. NBC fired Lauer after receiving a detailed complaint from a colleague about inappropriate sexual behavior in the workplace, the network announced on Nov. 29. “While it is the first complaint about his behavior in the over twenty years he’s been at NBC News, we were also presented with reason to believe this may not have been an isolated incident,” NBC said in a statement. Lauer’s co-anchors, Savannah Guthrie and Hoda Kot, announced the news that morning on the “Today” show. Guthrie read a statement from NBC News chairman Andy Lack. 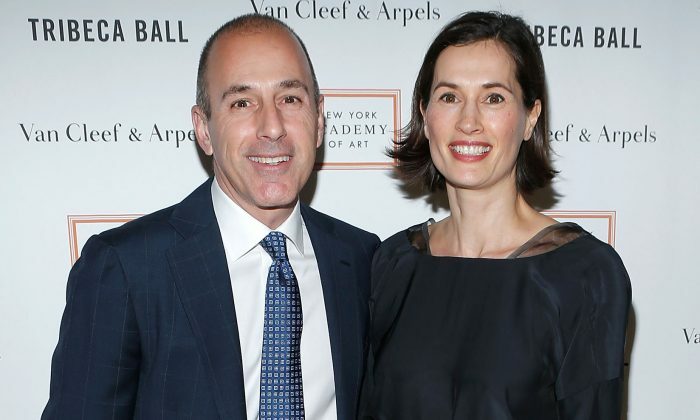 “Dear colleagues, on Monday night, we received a detailed complaint from a colleague about inappropriate sexual behavior in the workplace by Matt Lauer,” Lack’s statement read. Lauer wrote a statement of apology after the allegations broke. The statement was read aloud on the show on Nov. 30. “There are no words to express my sorrow and regret for the pain I have caused others by words and actions,” he said. “To the people I have hurt, I am truly sorry. As I am writing this, I realize the depth of the damage and disappointment I have left behind at home and at NBC. “He is weak and broken and ashamed by his own admission,” one of Lauer’s former colleagues told People magazine. According to sources speaking to the New York Post, Lauer drove to his son’s to school that day to explain what happened. “Matt’s first thought was that he needed to explain this to his son Jack in person, as it would be far more painful for him to read about it in the press and online. Matt drove out to Jack’s prep school this morning,” the source said. A source who knows the couple tells People that they have been very open with their kids about what happened. Roque, a former model from the Netherlands, met Lauer in 1997 on a blind date and married him less than a year later. Roque had previously filed for a divorce while pregnant with Thijs over a decade ago, citing “cruel and inhumane” treatment and Lauer’s “extreme anger and hostility” towards her. She later reconsidered. According to another source who spoke to Page Six, there were rumors that Lauer offered her a postnuptial agreement that promised her up to $5 million for staying in the marriage. After the announcement of Lauer’s firing, Roque reportedly took a trip to the Netherlands. “Annette has taken their two younger kids out of school and is believed to have left the U.S. and gone to her family in her native country,” a Hampton source told Page Six. Roque’s father told the Daily Mail shortly after the news broke that his daughter was planning to end the marriage. Lauer canceled his social media accounts after he left NBC and reportedly wants to lay low and focus on family. “He wants to be a regular Joe. To play golf and stay in the Hamptons. He has no intention of mounting a Billy Bush-style comeback campaign,” a source told the New York Post. “He wants to focus on his family,” the person added. On Dec. 10, Lauer was seen shopping in Sag Harbor, New York, with his daughter, a friend, and Roque, and later at his daughter’s riding lesson with Roque and their youngest son, Thijs. If you found this article interesting or informative, please consider sharing it on social media. Thank you!